Within 24 hours of receiving your completed Order Form, we will email you an invoice for the order including shipping costs: you can then use one of the payment methods listed below to settle the invoice. PayPal is a 100% safe, easy way to pay online using a credit or debit card and, as well as keeping your financial data securely encrypted: PayPal doesn’t share any data with sellers or merchants. PayPal is fast and free for the buyer. If you do not already have an account, you can set one up in minutes just by clicking on the PayPal icon above. 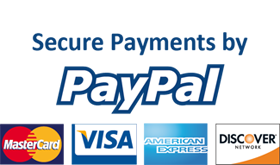 Then, to contact your country's PayPal office, click on the small flag that appears on the right-hand side of the lower margin of the PayPal page. Once your account is established, you can use the PayPal website to easily settle our invoice: they will pay us within a few hours, and we will confirm receipt of funds. There are no charges for buyers other than the usual fees associated with conversion of local currency into Japanese Yen. Please add JPY 4 000 to cover our bank’s clearance fees or ensure that you pay recipient bank fees as well as your own bank fees when ordering the transfer. Please add JPY 4 000 to cover clearance fees and mail to our Tokyo office using registered mail. Email: service@a-katsura.com or use Contact Form below. 1. Orders: The website www.a-katsura.com is the international business platform of Atelier Katsura, Tokyo, Japan and, under the terms stipulated therein, orders are accepted and shipped worldwide, except to Japan. Japanese nationals and non-Japanese residents in Japan should contact us by email prior to ordering. 2. Order Cancellation: Our customers have seven (7) calendar days from the day we receive payment--considered to be the order date--to cancel their order. This must be done by email and, within two (2) calendar days, we will respond with confirmation of cancellation and refund. There is no charge for cancellation under these conditions. 3. Customer Satisfaction: Since hakama and dogi are individually hand crafted and we are dealing with fabric that always stretches very slightly, customers are advised and asked to accept actual measurements may differ very slightly from those on the Order Form. Our experience and strict attention to detail has resulted in an almost 100% customer satisfaction rate. The result: many very enthusiastic reviews and repeat orders. However, in the unlikely event you are not happy with your hakama or dogi, please give us full details by email within ten (10) calendar days of receipt, and we will work with you doing our utmost to identify and deal with the issue. If we cannot solve the problem to your satisfaction, except where the problem arises from us being supplied with incorrect measurements, you can simply return us the item(s) by registered mail and, upon receipt, we will refund the invoiced amount plus any shipping charges you may have incurred. 4. Damage: all orders are shipped in sturdy cardboard boxes but, in the unlikely event damage occurs during transportation with marks indicating the package has been opened or damaged, the customer must notify the carrier immediately. A Damaged Package Report must be filled out and a copy sent to us by email or mail so we can contact our carrier. The item(s) should be returned to us by registered mail, and we will refund the cost of the return. Once we receive the returned item(s), we will send a replacement(s) on a priority basis. 5. Non-Delivery: Packages that are unclaimed or returned to us because of an incorrect delivery address (except those resulting from our error) or a refusal to pay taxes or customs duty will not be subject to a refund and the total cost of any reshipment will be to the customer's account.